Versailles’ Jack Osborne (36) gets wrapped up by a pair of Fort Recovery defenders during the final regular season game on Friday night. Fort Recovery won the game, 33-14. 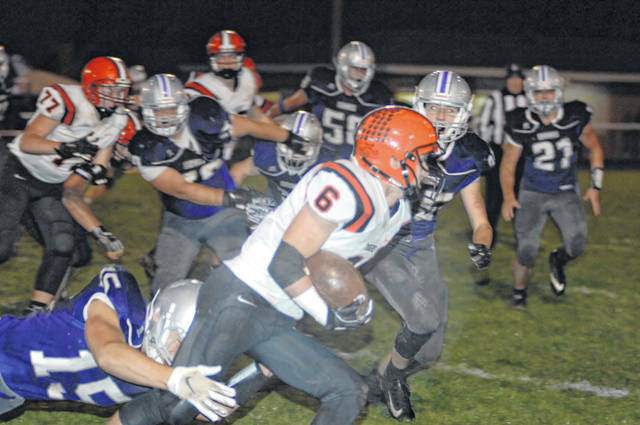 Versailles’ Jake Poling (6) tries to run out of a tackle during the final regular season game on Friday night. Fort Recovery won the game, 33-14. 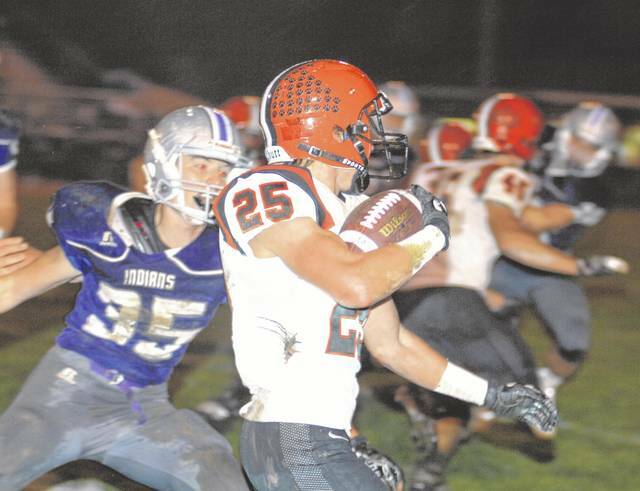 Versailles’ Nathan Wagner (25) tries to avoid being tackled during the final regular season game on Friday night. Fort Recovery won the game, 33-14. Versailles’ Ryan Martin (11) gets wrapped up by a pair of Fort Recovery defenders during the final regular season game on Friday night. Fort Recovery won the game, 33-14. 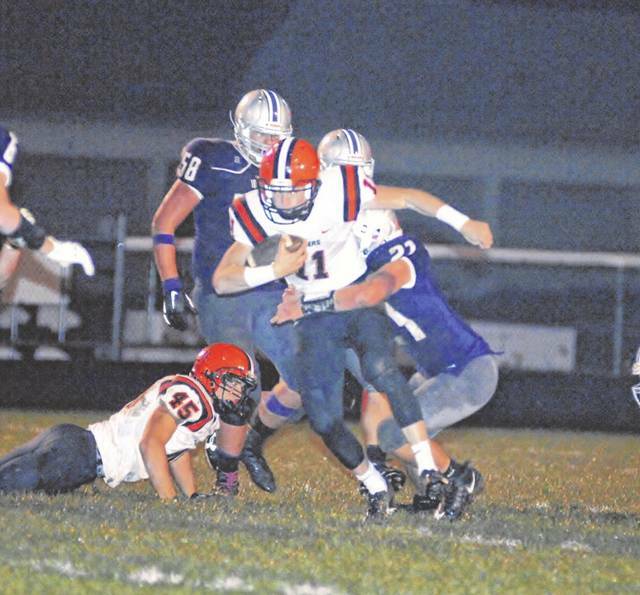 FORT RECOVERY – The Versailles football team ended a disappointing season with a disappointing loss to Ft. Recovery 33-14 on Friday. The Tigers fell behind 14-0 at halftime before getting the offense moving in the second half. The Indians scored on an 11-yard pass with 2:52 left in the first quarter. The Tiger defense held the Indians in check most of the first half, but with the offense struggling it was only a matter of time before the Indians would score again. The Tigers would punt five times in the half. The Indians would take a 14-0 lead late in the second quarter with a 40-yard pass. The Indian drive started at their 37, and moved into Versailles territory. The Tiger offense moved into Indian territory late in the half but ran out of time. The Tigers drive ended at the 26 as time expired in the half. The Indians opened the second half with a bang. Riley Pearson returned the kickoff for a touchdown. Just 17 seconds into the half, the Tigers trailed 21-0. The Indians scored again in the third quarter. A quarterback keeper went for 37 yards to the Tiger 3-yard line. A reverse pass put the Indians up 27-0. The extra point was no good. The Tigers got on the board with 29 seconds left in the third quarter. Faced with a fourth and four at the 26, Ryan Martin hit Evan Hiestand for a touchdown. The Indians were determined to crush the Tigers chances at a comeback. Starting at their 19, they gained five yards on first down. The next play went 76 yards for a touchdown. The Indians pulled a hook and lateral out of the bag that worked to perfection. The Tigers closed the gap to 33-14 with 8:57 left in the game. Aided by a pass interference, the Tigers scored on a 19-yard pass to Andrew DeMange. The Tigers attempted an onside kick, but it was recovered by the Indians.